Get ready to start your own incredible, amazing life…right? Alice McKinley is standing on the edge of something new—and half afraid she might fall off. Graduation is a big deal—that gauntlet of growing up that requires everyone she’s known since forever to make huge decisions that will fling them here and there and far from home. But what if Alice wants to be that little dandelion seed that doesn't scatter? What if she doesn’t have the heart to fly off into the horizon on the next big breeze? And what if that starts to make her feel like staying close to home means she’s a little less incredible than her friends—and her boyfriend Patrick? Sometimes the bravest thing you can do is be honest with yourself—and sometimes the most incredible thing you can do is sneak a little fun into all this soul-searching. I am a big fan of Alice books. I have read many of them. From The Agony of Alice until Including Alice. Thanks to Gramedia Pustaka Utama, the local publisher, who has published and translated the series. However they did not publish all books and skip some number but I still could keep the track. There was nothing missing. But when they finally decided to stop publish the next book, I was so sad. I still want to read all about her. So that was why I was so thrilled when I saw Incredibly Alice was available in March Grab Galley. 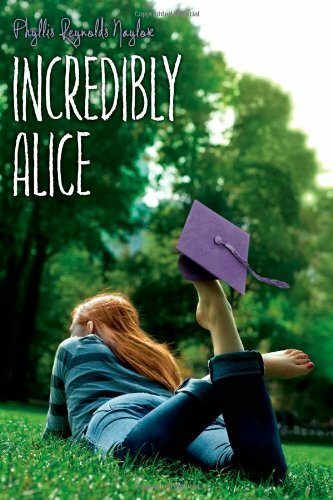 In Incredible Alice, she was already in second semester of senior year. It was also her last year in high school. Many things happened in this semester. I liked all those various events. The plan to spend summer holiday, School's Drama,Graduation party till the college application announcement that almost drove her emotions. From all of them, my favorite was her story about his brother, Lester.There was not many changing in Lester. He was still sweet. I enjoyed all time that Alice spent with him. I could see Alice and Lester took care of each other. Something that surprised me was her relation with Patrick. They have moved to the next level. When I was in the last page, all I wanted was reading the next book. Unfortunately this is the newest series so I have to wait till Ms. Phyllis write the next one. For the one who have not read any book of Alice series, they might find it difficult to blend with the story. I did not get used to with this kind of cover of Alice. Because all of her book that published in Indonesia was drawn. But I still like it. The Bookish Snob Promotions Wants You!! !